Who doesn’t like to eat food on a stick? 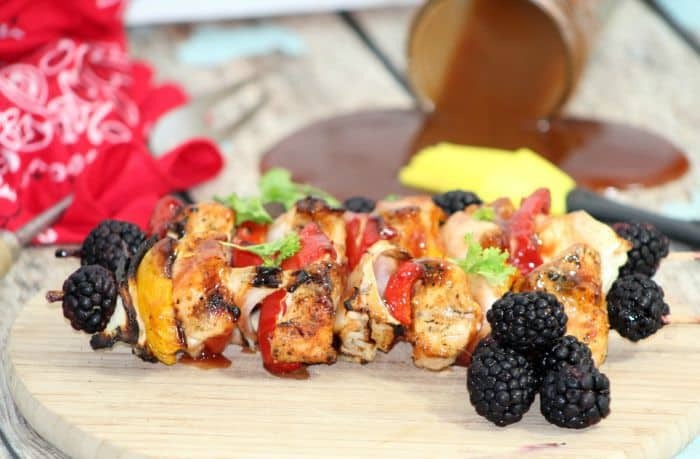 Portable and delicious these Chicken Kabobs with Blackberry BBQ Sauce will be the hit of your next neighborhood grilling bash. When you live in farm country, you eat a lot meat. Our neighbors are good to us. We have local butcher shops where we can buy top quality meats that we know were raised in our backyards. But just because you live in a rural community, it doesn’t mean you can’t eat like a king! Grilling and summer go hand and hand in our home. If it’s hot we break out the charcoal grill and get cooking. Thankfully it hot most evenings, so hubby does the grilling. He’s obsessed with charcoal and enjoys adding different woods for smoke and flavor. 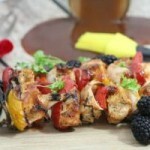 The Blackberry BBQ sauce puts these Chicken Kabobs in a category all their own. 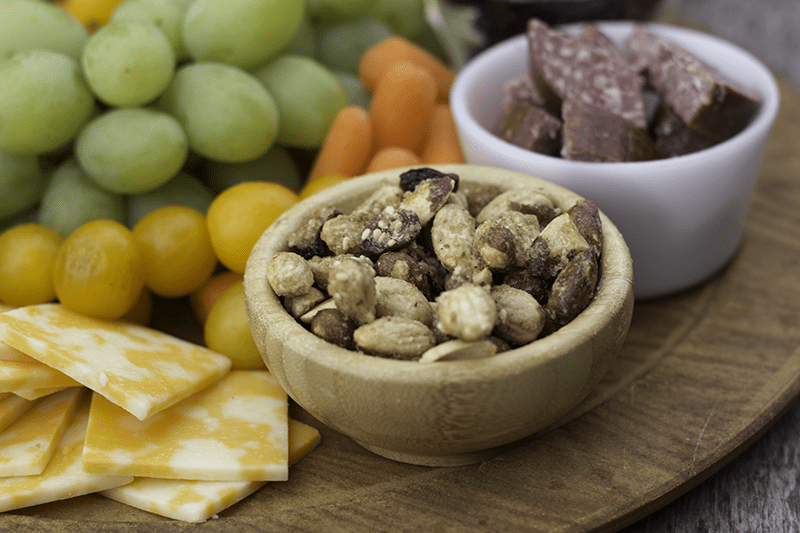 Think gourmet restaurant quality entree! We are so fortunate to be able to grow some of our own food here in rural PA. The blackberry bushes have been very good to us this year. I’ve had to get creative and us them in many meals from morning to night. I hope you enjoy the Chicken Kabobs with Blackberry BBQ Sauce as much as our family did. YUM! -Process blackberries in the blender until pureed….pour into a saucepan adding chicken stock on high heat….about 5-6 minutes…Pour through a mesh strainer to remove any chunks or seeds. -Return to saucepan over simmer-medium heat….add other ingredients…mix well…. continue on simmer until sauce is thick. – Put Chicken cubes in a large bowl sprinkle some Weber Kick’n Chicken all over them….put in refrigerator and chill for one hour. 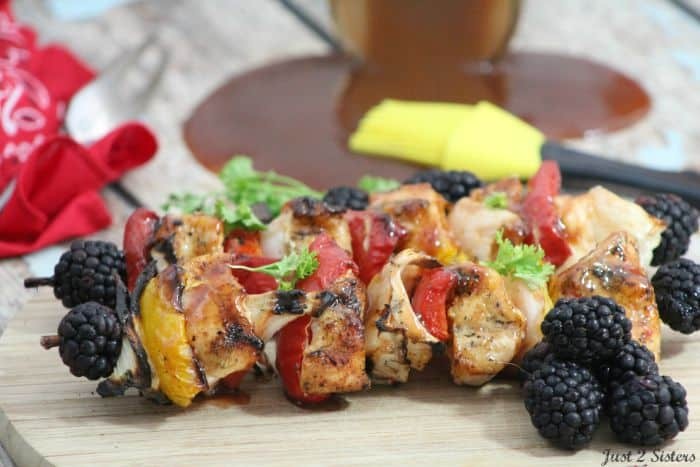 -Begin to build the kabobs…slide on the chicken, onion, chicken,red pepper, chicken, then yellow pepper.. if there is still more space on the skewer repeat ending with a fresh blackberry. -Grill for 20 minutes, rotating often and coating with the sauce. -Check to make sure the chicken is done (165 degrees) before removing all kabobs. Take advantage of the summer grilling season as often as you can. There’s just something special about the taste of foods cooked over an open flame. What are you grilling up this week? Pour through a mesh strainer to remove any chunks or seeds. Continue to simmer until sauce is thick. Put Chicken cubes in a large bowl sprinkle with Weber Kick'n Chicken until well coated. Begin to build the kabobs...slide on the chicken, onion, chicken,red pepper, chicken, then yellow pepper.. if there is still more space on the skewer repeat and end with a fresh blackberry. Grill for 20 minutes, rotating often and coating with the sauce. Check to make sure the chicken is done (165 degrees) before removing all kabobs. I’m a vegetarian, so I would probably use veggie stock for the the sauce and put it over grilled tofu! But this looks delish. Thanks for the recipe! Oh those are great tips on making the recipe vegetarian friendly! Thanks for stopping by. I love kabobs, and they are fun to make. 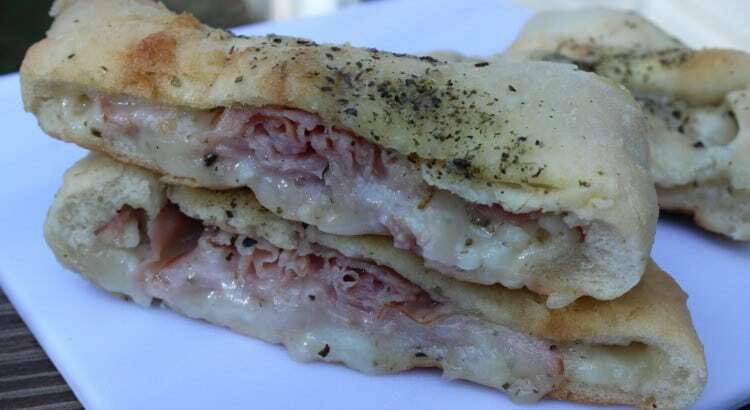 These look so delicious and fun to make. And the Blackberry barbecue sauce sounds amazing! 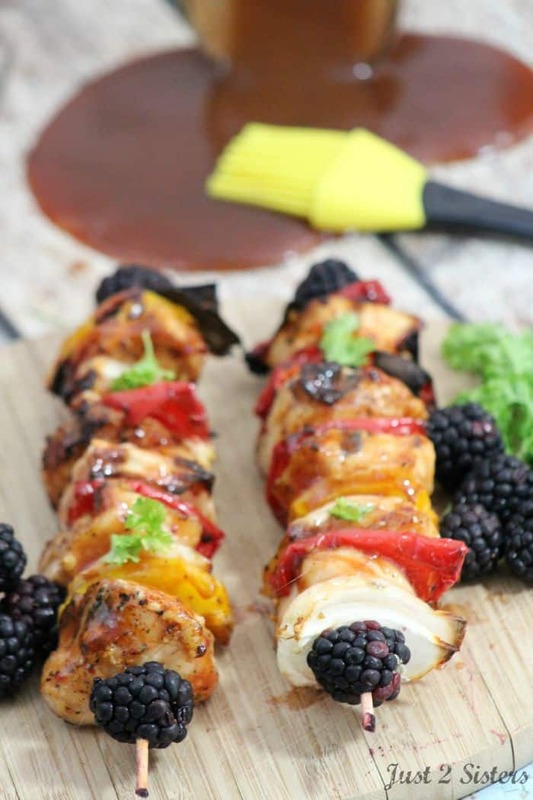 Oh my goodness, blackberry BBQ sauce sounds amazing! We are going to have to try that! 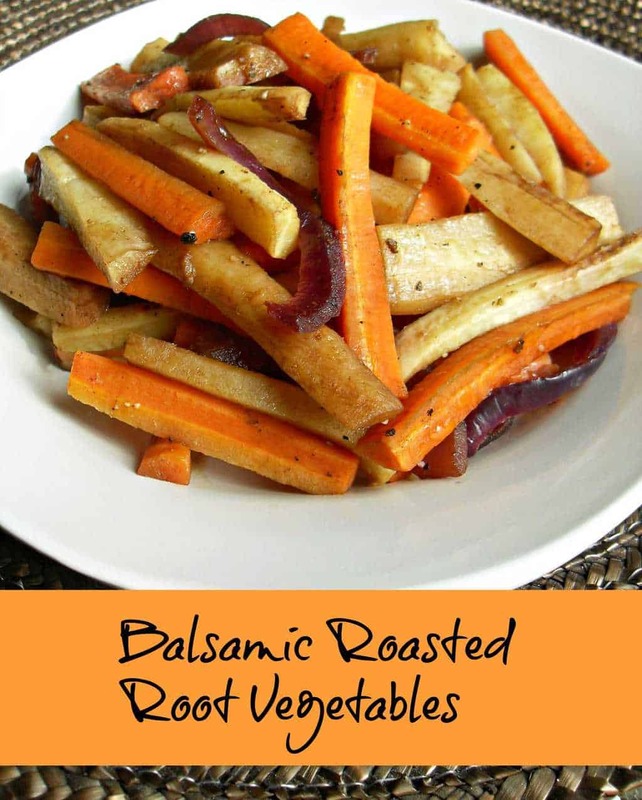 These are not only beautiful, but they look delicious and easy! What a perfect Labor Day BBQ dish! These are so pretty and look delicious!! Thanks for sharing at our Living With Style Linky Party. Be sure to come back next week!! Wow! I”ve never thought of adding blackberries to kebabs. So Yummy! Thank you for sharing, and thank you for linking up at the #HomeMattersParty this week. Hope to see you again next week. Mmm, yum! Very intriguing flavor combinations here. Interesting! I can’t wait to try this one. Thanks for sharing!